OmniSpeech LLC, a company developing technology that mimics human perception to make speech clear in cellular and related communications, has won the 2010 $50,000 SAIC-VentureAccelerator Competition, university officials have announced. The competition, made possible by funding from SAIC, supports companies in (or entering) the Maryland Technology Enterprise Institute (Mtech) VentureAccelerator program commercializing technology that solves problems in the areas of national security, energy and the environment, critical infrastructure, or health. VentureAccelerator is a fast-track program that guides faculty and student technology entrepreneurs in rapidly developing companies based upon their inventions. "Getting involved with companies such as OmniSpeech through this competition allows SAIC to explore promising new technologies that benefit national security and serve citizens," says John Ferriter, senior vice president of strategic program development for SAIC. OmniSpeech's technology could solve speech communications challenges for commercial, homeland security, assistive, and a wide range of other applications. Everyone has experienced poor call clarity resulting from loud background noise. Traditional technologies handle this problem by suppressing interfering signals, leaving a speech signal with some noise leakage, musical noise, reverberation or weakened syllables. Two microphones are sometimes employed to do this, with the hope that one takes in the speech signal and the other takes in the noise, but this can be difficult to achieve because you cannot control which direction noise is coming from. A second microphone requires additional hardware (most cell phones have only one), and special design considerations, as the microphones must be spaced apart on a phone and they may need to be manually calibrated. Many feature phones are too small for a second microphone to provide any advantage. OmniSpeech is the first company to look at this problem from the other perspective, that is, of "extracting" the clean speech signal from interfering noise signals. The company's technology uses a single standard microphone and a physiologically realistic model of how the ear detects tones to extract speech from noise. The noise can be stationary or non-stationary, it can come from any direction, and it can even be the speech of a competing talker. OmniSpeech's solution is architecture-agnostic, cost-effective, and can be integrated into the existing handsets or added to the firmware through an over-the-air upgrade. 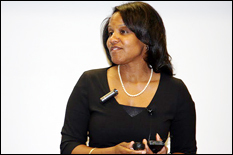 OmniSpeech was founded in 2009 by Carol Espy-Wilson, a professor of electrical and computer engineering in the A. James Clark School of Engineering and the Institute for Systems Research. The company joined VentureAccelerator in spring 2010. In May, 2010, OmniSpeech won the high technology category and $25,000, as well as a $15,000 Warren Citrin Social Impact Award, in the 2010 University of Maryland $75K Business Plan Competition. The company also won the grand prize in the 2010 Rockville Economic Development Inc. (REDI) StartRight! Women’s Business Plan Competition. OmniSpeech's team includes Tarun Pruthi, a research associate in the department of electrical and computer engineering. SAIC has provided $200,000 in the past two years to support Mtech's programs. This is the second year the company has funded the SAIC-VentureAccelerator Competition. Last year's winners of $25,000 each were FlexEl and Resensys. SAIC donated $60,000 to launch and equip the TERP Startup Laboratory, a new technology incubation program for University of Maryland faculty, students, and regional entrepreneurs who are too early for or don't yet meet the requirements for VentureAccelerator or the Technology Advancement Program incubator, but need a place where they can quickly develop their technology prototypes and get some help in starting their companies. The company also provided $39,000 for two years of educational internships in the Hinman CEOs Program, the nation's first living-learning entrepreneurship initiative. "We are excited about our ongoing relationship with Mtech through these initiatives, which collectively enable us to support the development of cutting-edge technologies at the University of Maryland," says Ferriter.